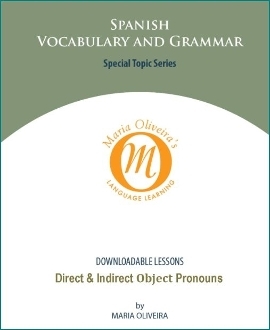 Did you study direct and indirect object pronouns in the past but find you still have questions about them? Fine-tuning your ability to determine when and where to place direct and indirect object pronouns in your Spanish sentences will dramatically increase your Spanish language proficiency. This lesson will clarify the rules of usage and then provide dozens of exercises to practice what you have learned. You will develop an understanding of this important grammatical construction and become more comfortable with your Spanish word choices. Improve your Spanish communication skills; language learning is all about the details! This link will be available for 2 days (48 hours), and you will have 2 attempts to complete the download.